Interest in global listed infrastructure has grown significantly in recent years, resonating among investors seeking to reduce risk while maintaining attractive total return potential. 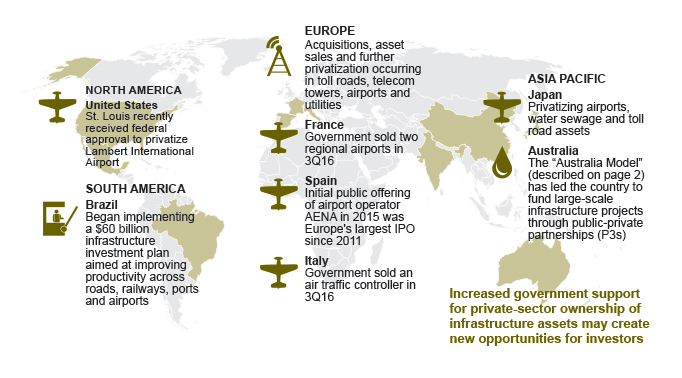 With more governments making infrastructure a priority after decades of underinvestment, the private sector is playing an increasing role in providing capital, creating new opportunities for investors. Why infrastructure? Listed infrastructure has historically offered equity-like returns, but with lower volatility and greater downside protection relative to global equities. Why now? In an era of strained government budgets, we expect many infrastructure spending plans will turn to the private sector to finance, own and operate infrastructure assets, expanding the pool of investment opportunities. Why active management? A skilled active manager offers the potential to enhance risk-adjusted returns by taking advantage of the significant performance dispersion across subsectors and geographies. The mention of specific securities is not a recommendation or solicitation to buy, sell or hold any particular security and should not be relied upon as investment advice. For a complete list of holdings of any Cohen & Steers U.S. registered fund, please see our website at www.cohenandsteers.com. Holdings are subject to change without notice. Long-lived assets: Infrastructure assets typically have useful lives of several decades, providing a long-term source of income. High barriers to entry: Strict zoning restrictions, large capital requirements and, in some cases, exclusivity agreements make it difficult or prohibitive for competitors to enter the market. Inelastic demand: Infrastructure provides essential services that often remain in demand even in periods of economic downturns. Predictable cash flows: Infrastructure assets are often regulated or operate under long-term contracts or concession agreements, typically resulting in greater cash flow stability relative to many other businesses. Historically, listed infrastructure has been a defensive and often countercyclical asset class, generally outperforming the broader equity market during business cycle downturns and periods of widening credit spreads, slowing growth and falling bond yields. The distinguishing historical characteristics of listed infrastructure have contributed to a significant rise in allocations in recent years (Exhibits 1, 2). At March 31, 2018. Source: Morningstar Direct, Cohen & Steers. Data quoted represents past performance, which is no guarantee of future results. Standard deviation is a statistical measure of volatility. Sharpe ratio measures the efficiency of returns, represented here as total return divided by standard deviation. Upside/downside capture represents the average proportional return relative to the broad market in months of positive/negative performance, respectively. (a) Dow Jones Brookfield Global Infrastructure Index inception date. See page 4 for index associations, definitions and additional disclosures. At March 31, 2018. Source: eVestment. There is no guarantee that any historical trend illustrated herein will be repeated in the future, and there is no way to predict precisely when such a trend will begin. See page 4 for additional disclosures. pressing need to spend more on infrastructure globally. In the last two years, Canada unveiled a $147 billion infrastructure program, Brazil has begun implementing its $60 billion infrastructure investment plan and the U.K. outlined a record $634 billion infrastructure investment pipeline. This is in addition to investment plans announced by China, Australia, Japan and others. Despite the calls for increased infrastructure investment, many government balance sheets are already stretched to the limits of fiscal responsibility. As a result, we expect many infrastructure spending packages will look to the private sector to finance, own and operate these assets. In our view, this capital void is creating the most favorable environment for private-sector infrastructure opportunities in a generation. The trend of infrastructure privatization has already led to a wide range of new opportunities around the world (Exhibit 3). In the U.S. and Canada, lawmakers have also discussed infrastructure privatization plans modeled after Australia’s asset recycling program. In this process, state-owned assets are auctioned off to the private sector, with the proceeds used to finance other critical infrastructure projects—providing a potential win/win for investors and the general public. At March 31, 2018. Source: Cohen & Steers. 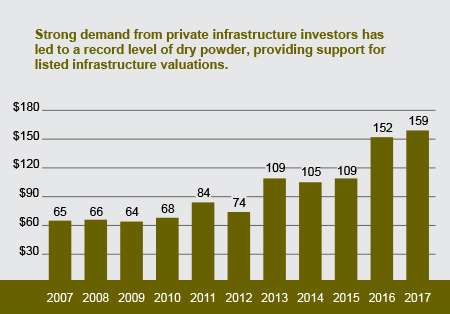 As demand for private investment opportunities in infrastructure continues to rise, many private infrastructure fund managers have had difficulty deploying their capital. With only a handful of active opportunities that exist at any given point in time, competition for assets is high, ultimately driving asset prices up and expected returns down. As a result, over $150 billion of capital raised by private infrastructure funds is sitting idle, waiting to be invested (Exhibit 4). By contrast, listed infrastructure investors have been able to implement allocations immediately due to the liquidity of public markets. Importantly, recent private infrastructure transactions have commanded notable premiums—well above implied cash flow multiples for listed infrastructure companies (Exhibit 5). We believe these factors are providing a rising floor of support for listed infrastructure valuations. At March 31, 2018. Source: Preqin, Goldman Sachs, Cohen & Steers. There is no guarantee that any historical trend illustrated above will be repeated in the future, and there is no way to predict precisely when such a trend will begin. See page 4 for additional disclosures. 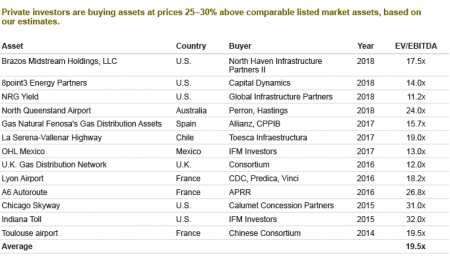 Private investors are buying assets at prices 25-30% above comparable listed market assets, based on our estimates. The mention of specific securities is not a recommendation or solicitation to buy, sell or hold any particular security and should not be relied upon as investment advice. For a complete list of holdings of any Cohen & Steers U.S. registered fund, please visit our website at cohenandsteers.com. Holdings are subject to change without notice. Recent private infrastructure transactions in the U.S. and abroad sourced from Goldman Sachs, Bloomberg, company reports and Cohen & Steers. EV/EBITDA refers to the ratio of enterprise value to earnings before interest, taxes, depreciation, and amortization using current fiscal year estimates. See page 4 for additional disclosures. Over the long term, the global listed infrastructure universe may benefit from greater government support for the privatization of critical infrastructure assets. In our view, this could result in a larger listed infrastructure universe, creating new growth opportunities for existing listed infrastructure companies through the acquisitions of privatized assets and the development of new assets. 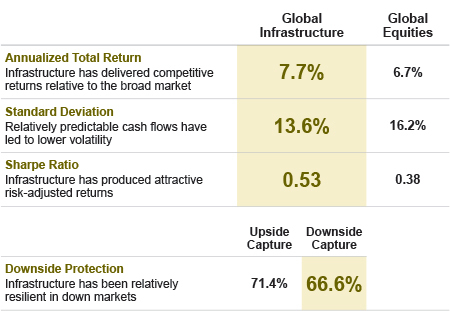 Historically, listed infrastructure returns have varied widely due to geography and subsectors. These differences underscore the importance of fundamental analysis, which is at the core of active management. By investing in an actively managed portfolio of global infrastructure securities, investors may benefit from the insights of professional asset managers, who can adjust a portfolio’s allocation based on their view of the risks and opportunities offered by various securities and market segments. This report was edited by Steve Heller. Index Definitions. An investor cannot invest directly in an index and index performance does not reflect the deduction of any fees, expenses or taxes. Global listed infrastructure: Dow Jones Brookfield Global Infrastructure Index, a float-adjusted market-capitalization-weighted index that measures performance of globally domiciled companies that derive more than 70% of their cash flows from infrastructure lines of business. Global equities: MSCI World Index, a free float-adjusted market-capitalization-weighted index that is designed to measure the equity market performance of developed markets. Data quoted represents past performance, which is no guarantee of future results. The views and opinions in the preceding commentary are as of the date of publication and are subject to change without notice. There is no guarantee that investors will experience the type of performance reflected in this commentary. There is no guarantee that any historical trend illustrated in this commentary will be repeated in the future, and there is no way to predict precisely when such a trend will begin. There is no guarantee that a market forecast made in this commentary will be realized. The views and opinions in the preceding commentary are as of the date of publication and are subject to change without notice. This material represents an assessment of the market environment at a specific point in time, should not be relied upon as investment advice and is not intended to predict or depict performance of any investment. We consider the information in this commentary to be accurate, but we do not represent that it is complete or should be relied upon as the sole source of suitability for investment. Investors should consult their advisors with respect to their individual circumstances. These materials are provided for informational purposes only and reflect the views of Cohen & Steers, Inc., and sources believed by us to be reliable as of the date hereof. The mention of specific securities is not a recommendation or solicitation to buy, sell or hold any particular security. Risks of Investing in Global Infrastructure Securities. Infrastructure issuers may be subject to regulation by various governmental authorities and may also be affected by governmental regulation of rates charged to customers, operational or other mishaps, tariffs, and changes in tax laws, regulatory policies, and accounting standards. Foreign securities involve special risks, including currency fluctuation and lower liquidity. Some global securities may represent small and medium-sized companies, which may be more susceptible to price volatility than larger companies. No representation or warranty is made as to the efficacy of any particular strategy or fund or the actual returns that may be achieved. Risks of Investing in MLP Securities. An investment in MLPs involves risks that differ from a similar investment in equity securities, such as common stock, of a corporation. Holders of equity securities issued by MLPs have the rights typically afforded to limited partners in a limited partnership. As compared to common shareholders of a corporation, holders of such equity securities have more limited control and limited rights to vote on matters affecting the partnership. There are certain tax risks associated with an investment in equity MLP units. Additionally, conflicts of interest may exist among common unit holders, subordinated unit holders and the general partner or managing member of an MLP; for example, a conflict may arise as a result of incentive distribution payments. MLPs are subject to significant regulation and may be adversely affected by changes in the regulatory environment, including the risk that an MLP could lose its tax status as a partnership. MLPs may trade less frequently than larger companies due to their smaller capitalizations, which may result in erratic price movement or difficulty in buying or selling. MLPs may have additional expenses, as some MLPs pay incentive distribution fees to their general partners. The value of MLPs depends largely on the MLPs being treated as partnerships for U.S. federal income tax purposes. If MLPs were subject to U.S. federal income taxation, distributions generally would be taxed as dividend income. As a result, after-tax returns could be reduced, which could cause a decline in the value of MLPs. If MLPs are unable to maintain partnership status because of tax law changes, the MLPs would be taxed as corporations and there could be a decrease in the value of the MLP securities. 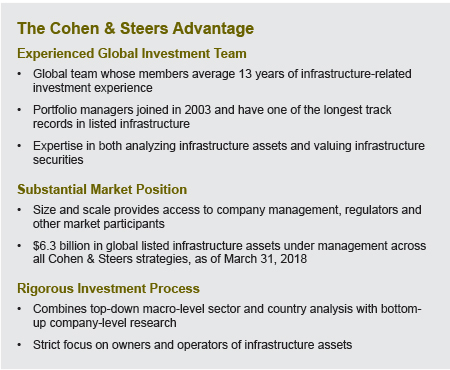 Cohen & Steers Capital Management, Inc., (Cohen & Steers) is a registered investment advisory firm that provides investment management services to corporate retirement, public and union retirement plans, endowments, foundations and mutual funds. Cohen & Steers U.S. registered open-end funds are distributed by Cohen & Steers Securities, LLC, and are available to U.S. residents only. Cohen & Steers UK Limited is authorized and regulated by the Financial Conduct Authority (FRN 458459). Cohen & Steers Japan, LLC, is a registered financial instruments operator (investment advisory and agency business with the Financial Services Agency of Japan and the Kanto Local Finance Bureau No. 2857) and is a member of the Japan Investment Advisers Association.